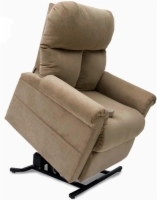 Lift chair recliners allow for you or your loved one to safely and easily get in and out of a chair again. We have separated our chairs into categories that make it easy for you to narrow your search no matter what your criteria is. We've categorize by size, price and the position type. Our lift recliner prices are the lowest you will find anywhere. We guarantee that you will not find a better price on any of the lift chairs we carry. With a wide selection of AmeriGlide, Pride, and Golden Lift Chairs to choose from, you're sure to find the perfect lift chair for your home at Mobility Superstore! We have a knowledgable staff standing by to answer any questions you have. Please call us anytime between 8am-Midnight EST, 7 days a week, all year. AmeriGlide makes some of the most affordable lift chairs on the market. Buy an AmeriGlide lift chair today! 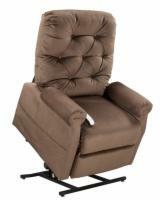 Golden Technologie's lift recliners are built by craftsmen using the highest quality components. This means you get a liftchair that will serve you trouble-free for years to come. Pride Mobility is the leading manufacturer of lift chairs in the world. Their years of experience in the industry allows them to provide customers with a wide array of quality lift recliners.